Here’s Mickey Hemstreet’s adaptation of Susan Beck’s Needle and Thread Shadow Box, featuring the 830 LE’s awesome alphabet collection. Micky is a customer of Thimbles, Lockport, IL. 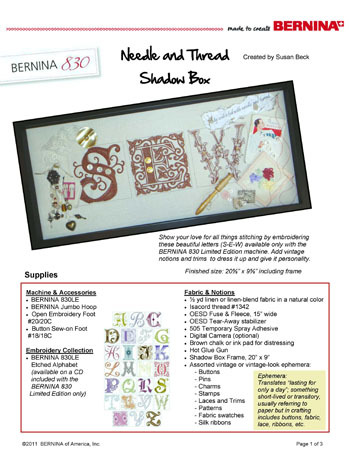 To make your own shadow box, download Susan’s instructions at the BERNINA USA webpage. 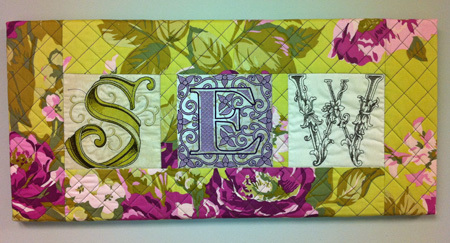 Kerry Finn used the same luscious lettering in her SEW wall hanging. Similar, but so different! For instructions, read her WeAllSew blog post, 830 LE Alphabet Project. 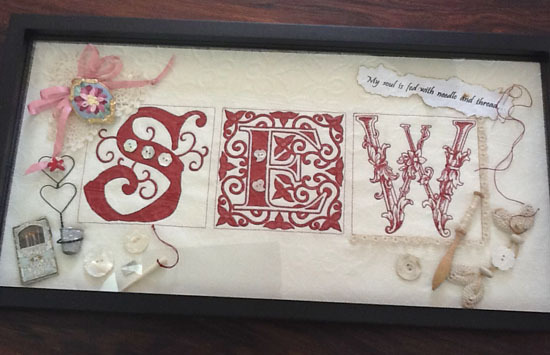 Here’s another SEW project, using a different alphabet, inspired by the January All About ME webinar (All About Machine Embroidery), stitched by Karen Donnelly, Patchwork Plus, Marcellus, NY. Don’t these just make you want to make your own SEW art? We’d love to see your creations! Send them to us at blog@berninausa.com. Previous Previous post: Last Minute Gift – Pillowcases!